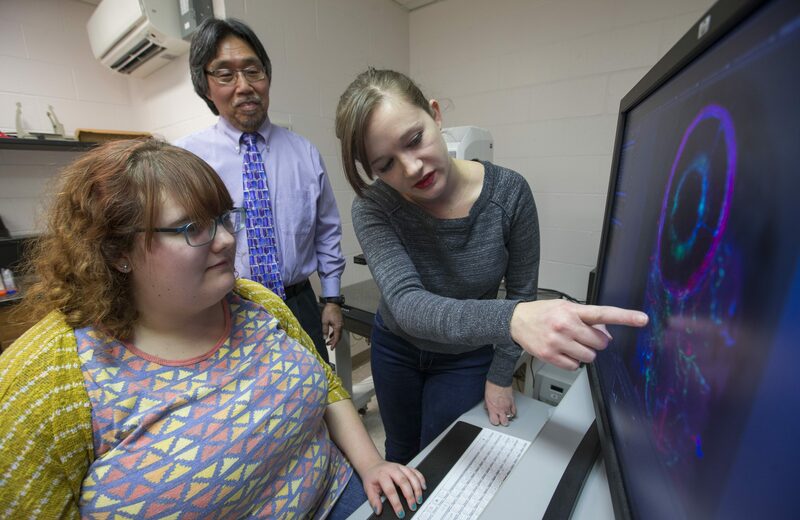 From left: Kaelee Plante, Don Sakaguchi, and Elizabeth Sandquist look at imaging of a zebrafish eye. More than 150 undergraduates have worked in Don Sakaguchi’s lab since he started researching at Iowa State University in 1991. Sakaguchi, a professor in genetics, development and cell biology, first grew enthusiastic about basic biomedical research while he was a junior in college working in a research laboratory. Now he gives undergraduates at Iowa State the same opportunity. Kaelee Plante (genetics ’18) has worked in Sakaguchi’s lab since the spring of her freshman year. She heard about his research from the genetics peer mentor group and sent him an email before ‘losing her nerve.’ After talking with him about his research, she applied through the First-Year Honors Mentor Program and got accepted to work in his lab. Plante started off nervous to send that email — but today she is a mentor in the lab to another new student. 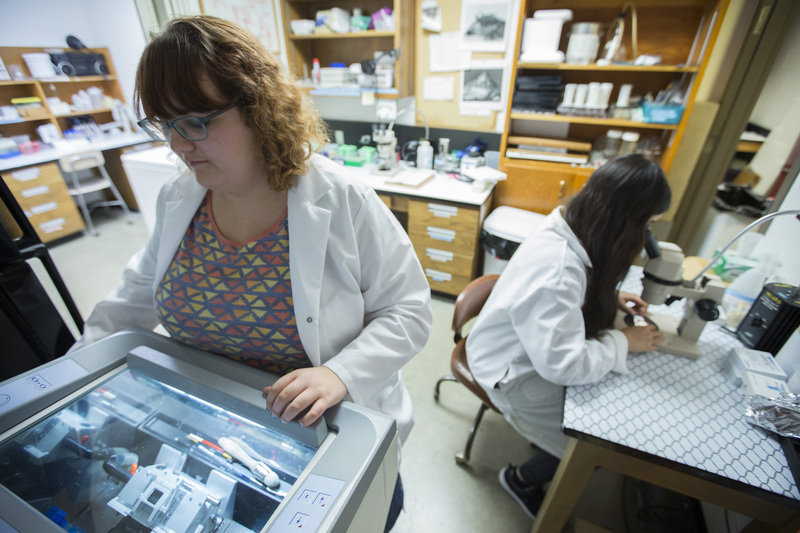 An exchange student from the United Kingdom, who has never worked in a lab before, works on a project with Plante and a postdoctoral fellow, Elizabeth Sandquist. Kaelee Plante and another student work in the lab. The lab learns together, meeting for journal club to discuss related research; socializes together, having dinners once a semester; and serves together, packing meals for Meals from the Heartland once a year. 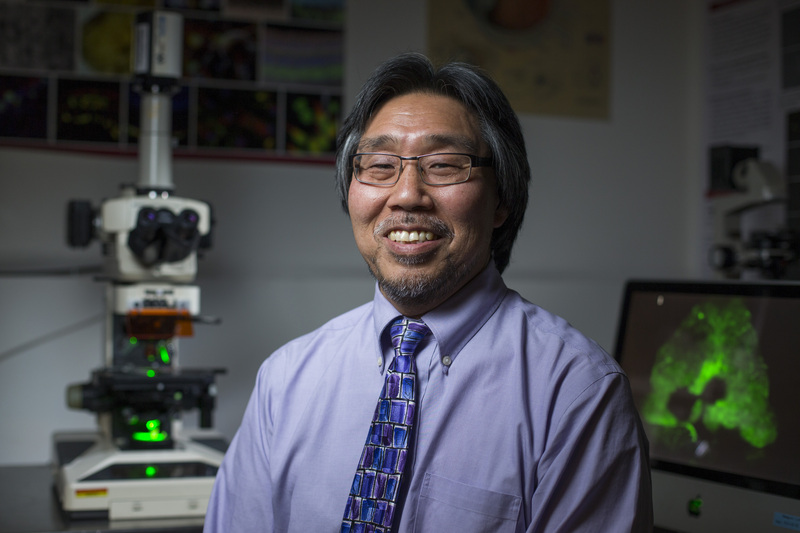 The Sakaguchi lab investigates experimental strategies to repair the damaged nervous system. Currently, nerve cells have limited ability to repair themselves. Sakaguchi and the students in his lab hope to change that through engineering stem cells. 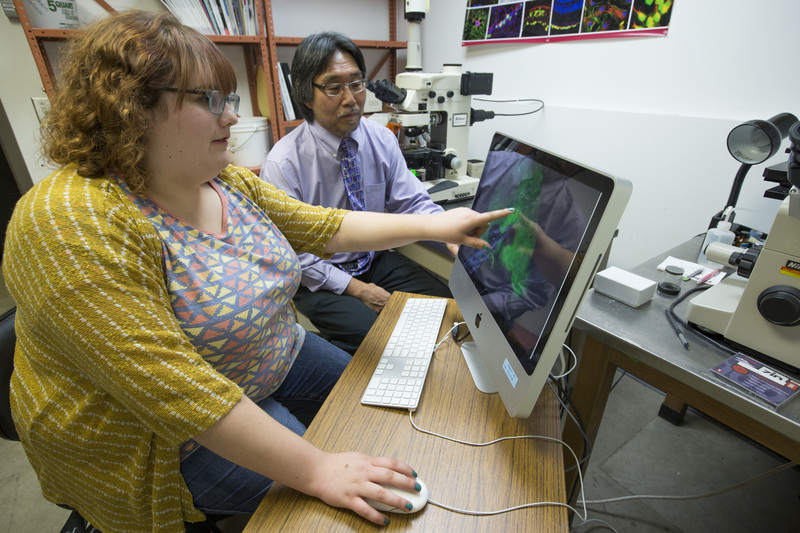 Kaelee Plante and Don Sakaguchi look at images together in the lab. Much of the work uses adult stem cells derived from either the adult brain or adult bone marrow. “It gives them a broader view of stem cell politics, ethics, as well as the research,” he said. Plante took the course the same semester she joined the lab to get a better idea of what a stem cell is and what it is capable of doing. As she looks forward to graduating in the spring and evaluates everything she experienced researching in Sakaguchi’s lab, she views it with no regrets.